Lana's Life: Hunk of Meat Monday: Chicken and a Bottle and a Bag! Hunk of Meat Monday: Chicken and a Bottle and a Bag! Don't know if this actually counts as a recipe, but I do this little trick all the time, and it saves me in the long run. In the big attempt to watch calories around here, I will mix a little chicken in with our beef. 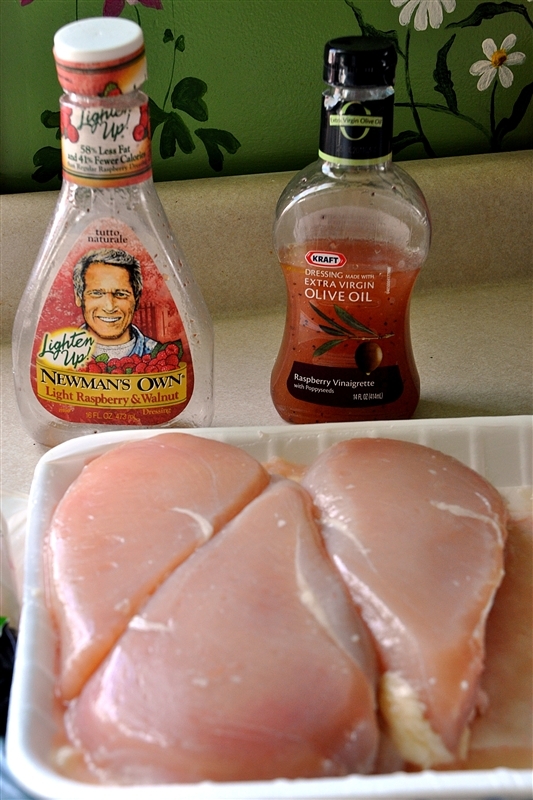 I like plain chicken, but sometimes it's nice to give it a little kick, so I will add a marinade. My big trick is to freeze the chicken breasts IN the marinade so they are absorbing all the yummy stuff before they freeze and as they unthaw. I use fresh chicken breasts, and then I add whatever flavor sounds good. I like Italian dressing and the raspberry vinaigrette. You can use your favorite mix, it's your boat you have to float. Just add a little of the liquid into a large freezer bag, then layer with the chicken. Squeeze all the air out, and pop it in the freezer for something fun later. Once you thaw these guys or gals out, you can turn them into any number of yummy meals. Serve them as they are, cut up and serve with a vegetable mix, fajitas, sandwiches, and so on! Just a quick trick to kick your chicken up a notch! Enjoy and visit Miss Leah's Hunk of Meat Monday for more great ideas. A good tip to freeze them with the marinade. Had not thought of that! I think this counts as a recipe! And the kids loved enough to ask for leftovers tonight (only there weren't any!). Yummy, yummy! Wouldn't that be great on the grill! Now that our snowbanks have finally melted, I'm going to dig ours out and start using it. Thanks for the tip! I have never thought of doing that.....I can't wait to try it. 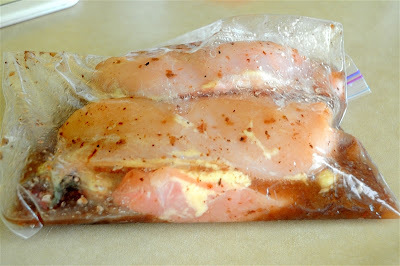 I freeze my chicken in marinades too! Makes it so much easier and full of flavor when you pull it out of the freezer. Thanks for linking up! Do you mix those 2 dressings to marinade? Just want to see if I'm missing some amazing combo!